I had the dishes in sinkful of lukewarm water last night, waiting for me to get around to washing them. They had been sitting there for over 1/2 hour. Suddenly there was an extremely loud explosive sound- we thought someone had thrown a rock through our window. It was one of my Corelle dishes spontaneously exploding in the water. Thank goodness the blast was absorbed by the water, but I've never seen a dish break into so many tiny, incredibly sharp slivers. Bought the dish set 11 years ago for "safe" dishes for my son to eat from. They are now in the trash. I was eating my dinner when suddenly a plate on the counter exploded. I was trying to figure out how this happened as nothing fell on it and it wasn't in contact with any other dishes. Incredible spontaneous explosion. I'm glad I wasn't right next to it when it happened. 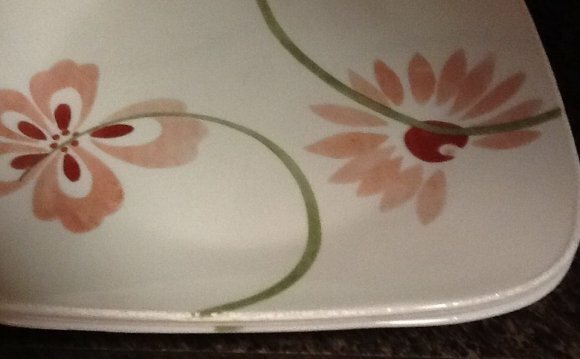 The dish set is about 10-12 years old. I have now had 3 corelle plates explode in this manner and I am banning them from my house. The most recent one was my 5 year old son wanted to be helpful and lift a plate from the coffee table up to the kitchen bench, he accidently dropped the plate on the way from a height of 2-3ft I guess. The plate literally went "pop" and exploded into thousands of razor sharp shards, for many feet in all directions. Many of the shards are tiny, only 1/10th of an inch (2.5mm) long virtually invisible unless you have your face against the ground. Much time was then spent cleaning this mess up, checking corners and pretty much everywhere within line-of-sight of the explosion. I previously had a Corelle explode and missed a shard when cleaning up, the shard got me in the foot, and what was most concerning was that every time i'd grip the shard with forceps in an attemp to remove it, it would just crumble and break off, almost like the plate hard gone very hard and brittle, hard enough to piece your flesh with ease, but so brittle any attempt to place any force on the shard and it will just break into even smaller pieces. I had written the previous incident off as some freak occurrence, but judging by repeat incidents and other people's similar experiences, I think these platese are just plain unsafe. I've never put these plates in the oven, they have been used in the microwave, but they state they are microwave safe. I bought these plates because there was an advertising campaign locally with Corelle 'unbreakable' plates rolling back and forth in a window alongside a Bus. Every time the bus would take off from the bus stop, the plates would roll to the back and bang against the one end, then every time the bus break roll forward and bang against the other end, you get the idea. Impressive you would think. The last thing from my mind was the very plates I bought for their supposed impact resistance and safety, was going to literally explode like a fragmentation hand grenade !! The more I read, I feel lucky that my plates haven't just exploded when put into contact with hot liquids or just spontaneously on the bench or dish drawer with no contact as others have ! !